Euler's disk is a fascinating physics toy. When you give it an initial spin on a smooth surface, it begins spinning and rolling (spolling) on its own. The spolling action of Euler's disk is similar to what happens when you spin a coin on a flat surface, but it lasts much longer! It's very interesting how the disk spins faster and faster as time goes on. The reason for this will be investigated. To analyze the physics of Euler's disk let's start off by drawing a schematic (shown below) which illustrates the disk spolling on a flat surface. rc is the horizontal distance from the axis of precession to the center of mass G of the disk, as shown. It is assumed that the center of mass of the disk coincides with the geometric center of the disk. To analyze the physics of Euler's disk as simply as possible, we shall treat ws, wp, and θ as constant. In reality, these quantities slowly change with time (e.g. the angle θ slowly gets smaller as the disk is spolling). However, since the rate of change of these quantities is small, approximating them as constant is reasonable. • The disk rolls such that rc = 0. This is approximately true as θ becomes small. 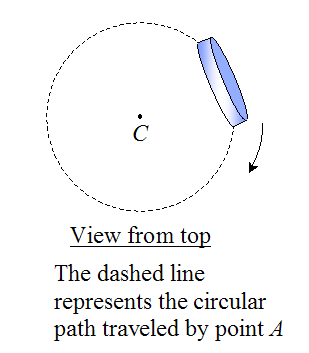 This means that the diameter of the circular path traveled by point A (represented by the dashed line) approaches the diameter of the disk as θ becomes smaller. You can see this is approximately true by looking at the previous video showing a spolling disk. With simplifying assumptions in mind, let's now redraw the schematic. The disk is treated as "thin" such that the thickness can be neglected. 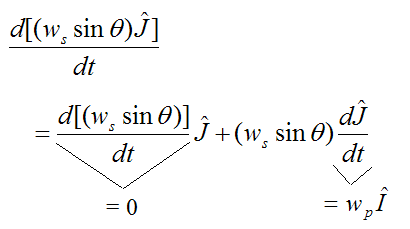 Note that the terms dJ/dt and dK/dt are calculated using vector differentiation. To learn more about it visit the vector derivative page. This expression conveniently relates ws and wp. If rc = 0 then point G is stationary, which means that the acceleration of point G is zero. Looking at the above three equations we see that they are equal to zero, as a result. 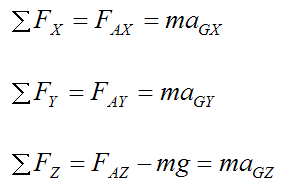 This means that FAX = 0, FAY = 0, and FAZ = mg.
Next, apply the Euler equations of motion for a rigid body, given that xyz is aligned with the principal directions of inertia of the disk (treated as a solid disk). This is the angular velocity of the disk (with respect to ground) resolved along the local xyz axes. This is the angular acceleration of the disk (with respect to ground) resolved along the local xyz axes. Thus, the second and third equations (of Euler's equations) are equal to zero. Therefore ΣMGy = 0 and ΣMGz = 0. As a result, the second and third equations do not contribute to the solution. ΣMGx is the sum of the moments about point G, in the local x-direction. 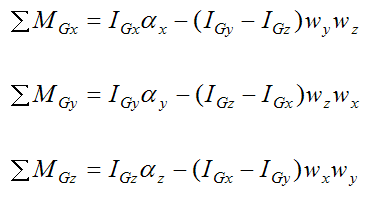 IGx, IGy, and IGz are the principal moments of inertia of the disk about point G about the local x, y, and z directions (respectively). This is the sum of the moments in the x-direction about point G.
This informative result tells us that as θ→0, wp goes to infinity. This is consistent with the rapid speed increase we see in a real Euler's disk as θ becomes small. The reason for this is because the right side of equation (3) contains a sinθ term, which goes to zero as θ→0. This means that (mathematically speaking) wp must increase to a large value. However, the above formula for wp is an idealized result. In reality there is a bit of slipping (friction) at point A and some rolling resistance as well. This would affect the solution somewhat if taken into account. As Euler's disk loses energy due to friction and rolling resistance losses, it also loses gravitational potential energy by an equal amount. This means that the center of mass G of the disk must gradually drop in height, which causes the angle θ to get smaller and smaller (as a result). This in turn causes the disk to precess faster and faster, according to the above equation. This process continues until the angle θ becomes so small that contact with the surface is inevitable and the disk is brought to a sudden halt. Euler's disk works best when friction and rolling resistance is minimized. This is achieved on hard, low friction surfaces, such as glass. 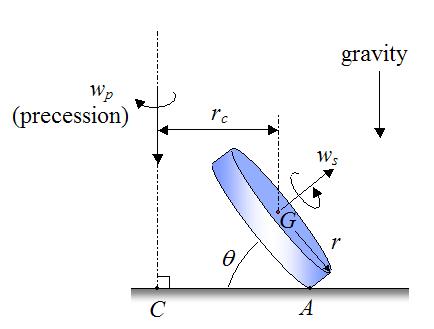 Although the model here neglects friction, Euler's disk cannot be modeled as a conservation of angular momentum problem. 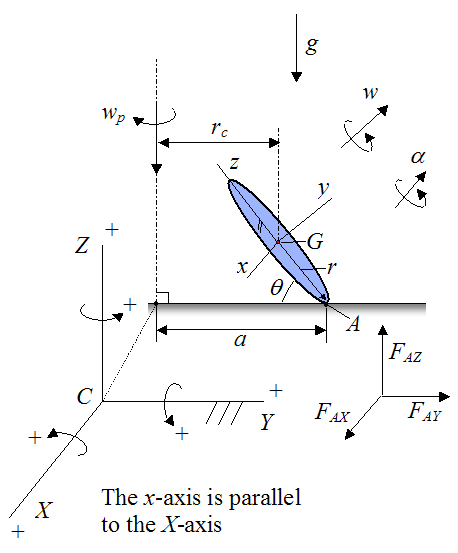 This is because there is a net moment (torque) acting on the disk about its center of mass G (due to the contact force FAZ between disk and surface, at point A). In closing, it is worth mentioning that the physics of Euler's disk is similar to the physics of a gyroscope. Their analysis is in fact very similar. Sign up below to receive insightful physics related bonus material. It's sent about once a month. Easily unsubscribe at any time.